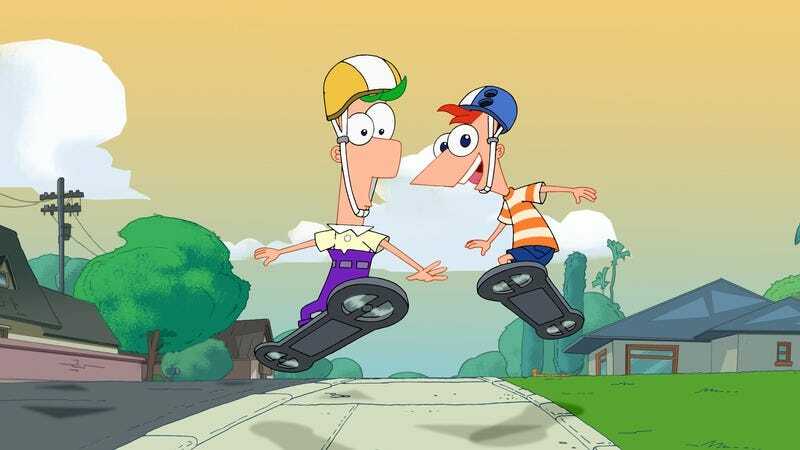 The “104 days of summer vacation” that inventive brothers Phineas And Ferb have been enjoying since 2007 will finally make way for the fall. TV Line announced that “after 126 episodes, five hour-long specials and a TV-movie, the animated series will air its final episode, ‘Last Day Of Summer,’” ironically enough on Friday, June 12. The news wraps up an awfully long stretch for the creative series, which featured an outstanding voice cast, inspired send-ups of its Disney brethren Star Wars and The Avengers, and some earworm-worthy musical numbers (see below). Not-so-coincidentally, Variety also announced today that P&F’s creators are about to embark on a new series for Disney XD, Mikey Murphy’s Law, which will debut in 2017. “The upcoming series from Dan Povenmire and Jeff ‘Swampy’ Marsh introduces Mikey, the fictional great-great-great-great grandson of the Murphy’s Law namesake,” Variety reports. Given their P&F track record, hopes are high for the new series. In the meantime, Phineas And Ferb will receive what can generously be considered a long goodbye. An hour-long special this fall, The O.W.C.A. Files, will delve further into the adventurous life of Perry The Platypus and his band of secret agents. In addition to the final episode, Disney XD will kick off a 73-hour marathon of every P&F episode on Tuesday, June 9. After the marathon, Variety says that “the series will continue to air daily on Disney XD,” likely into infinity.